Apple’s desktop operating system, Mac OS X, has a really confusing naming scheme. Its predecessors were Mac OS 9, 8, and so on. But when Apple went big at the turn of the millennium, introducing a completely reengineered operating system, it called it Mac OS X – the Roman numeral for 10. With the latest release, that tautologous, feline naming confusion seems to have come to a stop. 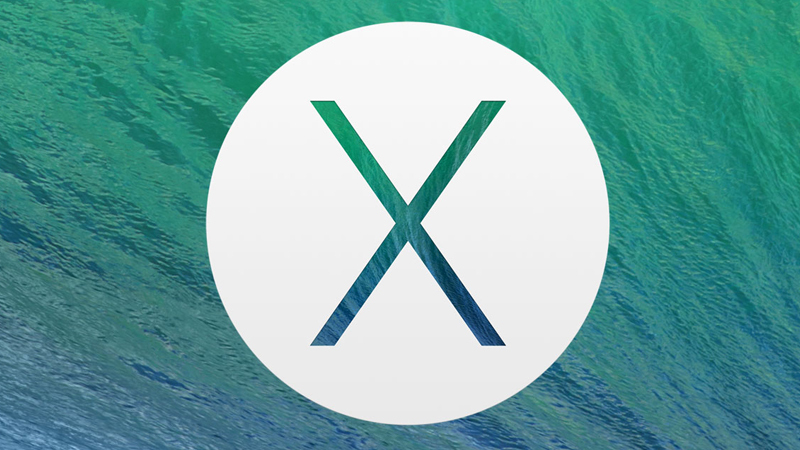 Apple now simply calls the operating system Mac OS X Mavericks. The first part refers to the operating system, and omits the version number. The last bit is just the codename. As of 10.9 (the official release number for this version), Apple’s dropped the big cats in favour of its favourite places. In this case, Mavericks beach, in California – a popular surfing location. The Mavericks theme carries through to the default wallpaper for a fresh installation of the operating system – but only those who buy new Macs will see this, before deciding to change it. Aside from simplifying the naming scheme, Apple has drastically changed the pricing scheme. Previous versions of Mac OS X have always cost money. It used to be $129 (around R1 300) for older upgrades, but more recently Apple’s generosity has seen prices drop to $29 (around R300). Even that is a pretty great price for an operating system upgrade, but the company’s choice to make Mavericks a completely free upgrade is astonishing – but very, very smart. We’ll get to that in a bit, but here’s what’s changed in Mavericks, and how it all works. iOS 7 might have received a drastic, love-it-or-hate (we love it) overhaul of its interface, but Apple’s designers were more cautious when it came to beating OS X with the ugly stick. 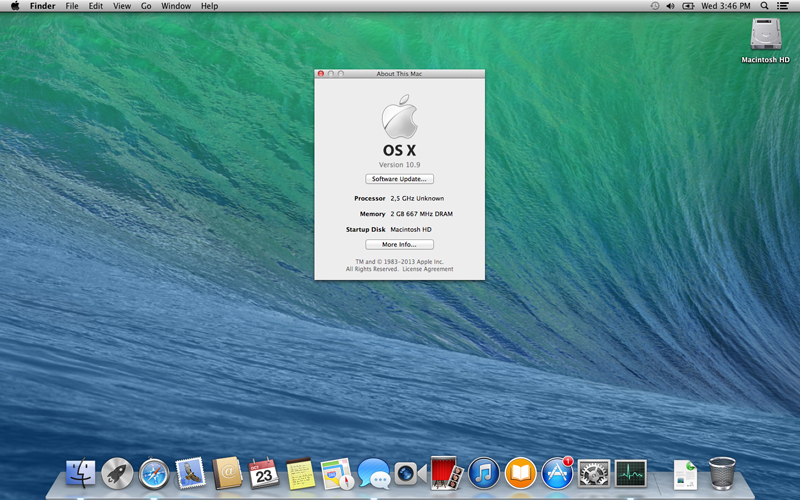 Mavericks retains the general look and feel that OS X has had since 10.6 (Snow Leopard), though the core elements have been there since the version release of OS X. 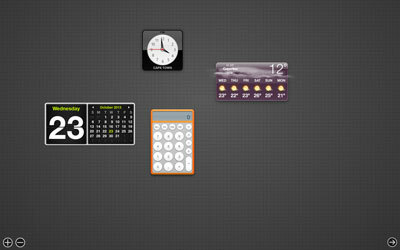 Go wild and arrange your widgets with the new grid wallpaper in the Dashboard. Despite that, things look slightly different in this latest version of Apple’s desktop OS. There’s no huge, sweeping change where it’s easy to point out exactly how it looks different, but the subtle changes are noticeable, here and there. Fonts and text look crisper. Some of the gradients have changed – in the Notification Center, Dashboard, and Login screens there is no more textured, grey linen. Those areas now have plain dark shades or gradients, though the dashboard now has a grid background. It’s not offensive at all, so will probably age well, but it’ll likely be a huge boon for all those OCD types who absolutely have to line up their widgets with perfect spacing. Then again, some might wonder why Apple’s stuck with the ageing Dashboard, but in this case it’s a feature that still gets used by some – there is a great selection of useful widgets, and its quicker to keep live info there than load it up in a separate app or website. In fact, the linens, leathers, and papers are all visual effects that have been stripped from Mavericks. The previous version of OS X, Mountain Lion, heavily featured skeuomorphic designs. Calendar with its torn paper and stitched leather; Contacts with a Filofax look – all those gaudy lookalike elements have been stripped from those applications in Mavericks. Everything is now cleaner and more clinical, but the functional aesthetics are a little boring. Old and new app icons mix it up, and look out of place doing it. Strangely, Apple didn’t change the application icons for those overhauled apps. Maps and iBooks, both new applications in Mavericks, have shiny new icons that echo the simpler, cleaner design language used in the apps themselves. But Notes, Calendar, Contacts, et al? Those still have the same old icons. A little spit and polish would have done a world’s good, here, even if it were just to give the entire OS a look of newness when first booting up. Sparkles! Do they make everything better? You be the judge. Even more bizarre is the new graphical effect added to Launchpad, the screen where all applications can be accessed from. Installing a new application will show the progress bar that’s always been there, during the download. Once it’s installed, though, there’s a sparkling effect surrounding the icon to denote that it’s a newly-downloaded app. All that, while iOS gets a simple, neat blue dot next to new applications, and download progress is depicted as a pie chart on the application icon. Overall, the look and design of Mavericks is good when it’s good, but where Apple’s failed to pay attention it shows. 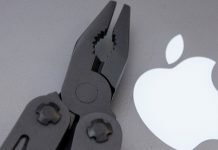 When Apple unveiled Mavericks at its World Wide Developer Conference (WWDC) earlier this year, it really pushed the new underlying tech in the operating system. It did so again, last night, at the official announcement. The memory, graphics, processing, and power management subsystems have all been tweaked and improved to be more efficient. These aren’t new touchy-feely features that users with which users can get hands-on. Yes, we all like shiny new things, but that doesn’t mean the improvements that have been made here can be discounted – the effects of the changes here will definitely be felt, and yield real-world benefits. Those who’ve used previous versions of OS X, and even older versions of Mac OS, will have one word for how those operating systems handled memory allocation. And it’s not a very kind word. While modern Macs come with a generous amount of RAM – anywhere between 4 and 8GB, depending on the model – Mac OS X just loves giving applications resources. Empty RAM is pointless, because it is a resource that could be used to help applications load faster when they’re open, so apps are given as much memory as they need. The problem is that once the physical memory in a system has been filled it has to resort to swapping that data to the hard disk. If you have a regular hard drive you’ll know the feeling: you’ve clicked on something and it takes a while to load. You hear the drive thrashing away, but nothing’s happening on screen. This is because OS X has to move data that’s in RAM to the hard disk, to make space in RAM for the new application you’ve just launched. Mavericks does away with this almost entirely – and there’s proof. Apple says it’s implemented memory compression, which allows it to fit 6GB of data in 4GB of RAM. Without getting into the intricacies of compression we’ll just say that it’s a solid technology and excellent design decision. It’s made possible by modern processors being incredibly fast – to the point that they have enough processing power to do things in the background without affecting other running tasks. Compressing data in memory is something for your processor to do, and the net effect is that everything is faster. 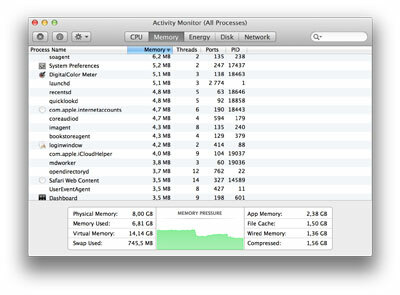 Taking a look at the Activity Monitor, it breaks down memory usage and shows that very a very small swap file is in use. 100MB or so is nothing compared to the gigabytes-large swap file (also called page file) used in previous versions of OS X. It also shows the amount of compressed data in memory, with the physical memory completely maxed out. Using the processor to compress data in RAM does cost something: power. But it costs a lot less power than having the OS resort to paging. It’s a huge efficiency win, and the operating system has never felt faster. In OS X 10.6 Apple introduced something called Grand Central Dispatch (GCD). This wasn’t a feature any regular user had access, but rather something the core operating system used in the background. GCD would take all the available processing resources in the computer and make them all available for applications to use. This means that the four cores in your quad-core Intel Core i7 processor would all be used. It also meant that the graphics chip inside your computer could be used for something other than graphics. The technology that made that possible was called OpenCL (open compute library), and it lets graphics chips – which are optimised to be very fast at the kind of maths used in graphical computations – be used for other tasks. How does that relate to Mavericks? Well, it now makes better use of the built-in graphics chips inside Intel processors. Until now, OpenCL and GCD have only used processing resources from discrete graphics chips, like those from AMD and NVIDIA. 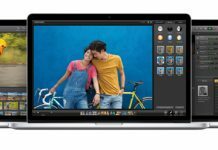 If you’ve bought a Macbook Air recently, or even the 13-inch Macbook Pro with Retina display, you’re using a machine that has its graphics chip built into the Intel processor, and you’ll now benefit from applications that utilise OpenCL and GCD. An immediately noticeable result is smoother graphical performance when navigating the operating system. One of the machines in our test fleet, a 13-inch Macbook Pro with Retina display, often stuttered in regular use. This is largely due to the Intel HD graphics solution simply being unable to keep up with the huge resolution of the Retina display. In Mavericks, the stutters are all but gone. Scrolling is smoother, and visual transitions are as slick as they are on any of the other machines. Apple’s also improved the way the operating system handles video playback. This isn’t necessarily faster – after all, video can only run so fast – but it is definitely more efficient. With some shuffling in the way video gets processed, more processing is offloaded to the specialised graphics hardware in Macs. This means less load on the power-hungry processor, and ultimately more battery life. More battery life to watch video? Sign us up. One other addition is dynamic memory allocation. The Intel HD graphics chip uses system memory, and until now that’s been a set amount of shared memory. Mavericks makes this a dynamic resource. When you’re browsing the web and checking mail, you’ll only need 32MB of video memory. But when you’re playing games it can allocate up to 1GB of system memory to the graphics processor. These changes matter a lot. Apple’s most popular range is its affordable Macbook Air lineup. Anything that makes those machines faster, more efficient, and last longer on a single charge, is a good thing. As with the technologies above, processing and thread management has also been improved. Traditionally operating system kernels will let applications access the processor as and when they need it. This means that a processor powers up and down, doing calculations on demand. It’s also very inefficient. Think of it as going to the shop to buy milk. And then going back to the shop to buy bread. And back, once more, to buy eggs. In Mavericks Apple has implemented process coalescence: it lets the operating system organise threads so that they’re executed more efficiently. It lets milk, bread, and eggs all be brought back on the same trip to the shop. This demonstration from Apple’s site explains the timer coalescence in Mavericks. The single biggest benefit that laptop users will immediately enjoy from the moment they install Mavericks, is battery life. Apple claims up to 1 hour more battery for its latest 13-inch Macbook Air equipped with an Intel Haswell processor. In testing that machine already got a whopping 12 hours of use on a single charge, but with the ultra-efficient power management in Mavericks, it’ll be even more. One test has already pegged it at more than 15 hours – simply incredible for an ultralight machine with the kind of processing power on offer from Intel’s latest chips (which are also to thank for the newfound power-sipping habits). The 13-inch Macbook Pro with Retina, which we used for most of our testing, has a stated battery life of seven hours. In use, especially chugging away on Retina-level graphics and heavy use, this was closer to 5 hours. Just by installing Mavericks the battery life in the Retina Macbook has improved dramatically. It was able to go a whole day with normal use, which includes leaving it unattended during meetings, having between 5 and 15 tabs open in Safari, listening to music, running brightness at 80%, and having wireless on all the time. 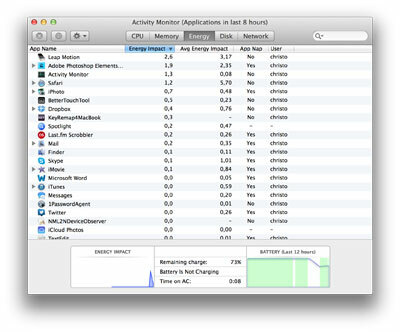 Synthetic battery benchmarks might give a comparative evaluation between Mavericks and Mountain Lion, but while the difference in those benchmarks might be one hour or half an hour, the real world use cases are different. 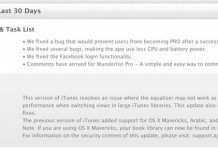 In a regular work environment Mavericks will yield far better battery life than previous versions of OS X on the same hardware. All of the under-the-hood changes mentioned above are responsible for the improved power consumption, but those changes were aimed at making things more efficient overall. Improved battery life is just a byproduct of not using a swap file or having hardware-accelerated video. Mavericks has some power-management-specific enhancements, too. App Nap is one of those. This lets the operating system freeze apps that have no visible windows. For example, your Twitter application has an open window, but it’s obscured by a fullscreen Safari window. This is a condition for Mavericks to send the Twitter app into low power mode, so to speak. Or if you have Safari open on a second desktop, but are currently composing an email. Safari gets put on hold, unless it’s actively doing something like playing a video or downloading a file. While applications can be coded to be more efficient, Apple has opted to enable App Nap for all applications, on a global basis. This way users benefit from better battery life even if they’re using poorly-coded software. It’s also easy to monitor battery life and see where your power is going. Click the battery icon on the menu bar and Mavericks tells you which applications are currently draining the most power. This doesn’t mean you have to kill the app right away, but at least you know what is eating the processor and impacting power consumption. It’s also possible to monitor power usage in Task Activity monitor, which now includes a tab for energy usage. Developers have also been given tools to identify where their applications fall on the power consumption scale, and can use those to set themselves goals for efficiency. Simply put, power management and efficiency in OS X Mavericks is to other operating systems as hybrid cars are to the a 1970s American V8. You’ll see an improvement no matter what laptop you’re using, as long as it supports Mavericks. And you won’t have to micromanage applications to get the best mileage out of your battery – OS X does the hard work, and you just enjoy more computing away from a wall socket. 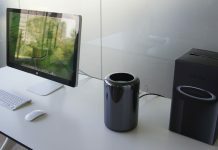 Of course, regular desktop machines like the Mac Mini and iMac will also benefit. They’ll run cooler and quieter, and your power bill will be that bit lower as a result of these new changes in energy efficiency. With each revision of OS X Apple takes the opportunity to update important applications. For a modern operating system this includes the file manager and web browser. That would be Finder and Safari, respectively, on Mac OS X. Apple has also included two new applications with Mavericks: iBooks and Maps. Finally, it’s updated other applications like Launchpad, Calendar, Notification Center, Contacts, and even Photo Booth. Here we’ll cover the apps that have seen the biggest changes and additions, as well as a quick look at the smaller applications that have been updated. Finder in Mavericks makes file management simpler than ever. It’s retained the four different views, and a sidebar for navigating subfolders in a user’s home folder, but it has gained two important new features. 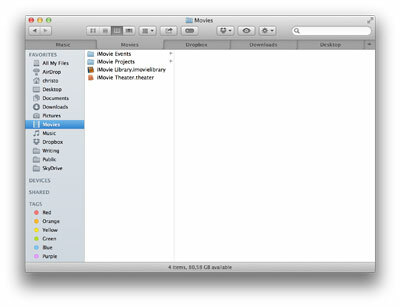 The first is tabs, which attempts to do away with the clutter of having multiple Finder windows open at once. Just like you’d use tabs to open multiple sites in your web browser, tabs in Finder lets you have multiple folders open in a single window. This is far neater and more manageable than trying to find the Finder window you last had open. It’s especially useful when you want to drag files between folders without navigating away from the source folder: simply drag a file from the current folder to the tab of the source folder. In the preferences pane for Finder there’s an option to open all window as tabs, which sounds like a fantastic way to implement the feature and get users using it, but that’s not the case. On both our production machine as well as a test machine with a fresh install of Mavericks, Finder always opened a new window for each folder. The only way to get windows to open in a tab was by right-clicking on a folder and selecting “Open in New Tab”. Either this functionality is improperly implemented, or it doesn’t work in the way we imagine – but one thing’s certain, it doesn’t reduce the amount of Finder window clutter, and renders itself moot. Opening in tabs is not the default behaviour, and the only way to get tabs is by actively seeking the option. Tags the other addition to Finder is far more intuitive and definitely very useful. Tagging now replaces the old colour-coded labels that have featured in OS X since its inception. Mac users will be familiar with the option to right-click on a file or folder and assign a coloured label to it. This was a great way to spot a specific, important document in a crowded folder. Those colour-coded labels have now been replaced by the new Tags feature in Finder. You still get colours, but it’s possible to use more than one tag for a file or folder. It’s also possible to create more tags. This, in a roundabout way, replaces the need to have separate folders for work and personal documents, for instance. All you have now is a single Documents folder, and each file in the folder is tagged appropriately. Create a Work tag for work-related documents. Or a Homework tag for school projects. The same goes for music – perhaps you want different tags for music you’ve bought and music you’ve downloaded for free. Photos could have tags for those you’ve processed and those you’ve yet to run through Photoshop. Creating new tags isn’t a big hassle, either. 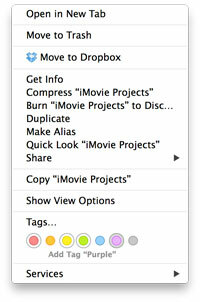 When you saving files in Mavericks there is a new file save dialogue box that presents the option to add new tags for that file, or to select an existing tag from a drop-down list. Since this is a system-wide dialogue box, applications don’t need to be coded to take advantage of it. More conveniently, those tags are part of Finder, and you can simply search by tag, or use the sidebar in Finder to quickly filter out the files you need. Apple’s web browser might not be as popular as Chrome or Firefox, but that doesn’t stop the company from making sure it’s the best possible browser for OS X. It wins on that front through sheer convenience and integration with the Apple and iCloud ecosystem. Now in its seventh iteration (Mac OS X 10.8 had Safari 6, Mavericks has Safari 7), the web browser has been overhauled to keep up with the rapidly evolving world of internet technologies. While Safari has had the Webkit2 rendering engine since OS X 10.7 (Lion), it hasn’t been the best. Apple might have rated Safari’s performance highly, and scored top marks in synthetic benchmarks, but in the real world it was a bit of a mess. We’ve lost track of how many times a single tab in Safari has caused the browser to hang. There’s also the dreaded dialogue box that pops up saying the window isn’t responding, and all tabs need to be reloaded. With Safari 7, Apple’s revamped the way tabs are handled by the browser. Each tab is a different process, meaning that the single “Safari Web Content” process doesn’t handle all the data. If one tab causes a problem Safari can simply terminate that thread and reload the tab without affecting others. It’s far more stable, and not a single issue was encountered during our testing with Mavericks. It’s also a lot faster, despite some of the power-saving tech that’s gone into it. Scrolling around content-heavy sites, CSS-intensive demos, and WebGL applications sees it get a workout, but never once does it fall over or slow down. Interface features have also been added. The Top Sites display, which shows the most-visited web pages, now includes the Safari Sidebar. This new view replaces the old Reading List view, and now adds a Bookmarks view (with organiser), as well as an iOS 7 feature called Shared Links. The latter is the newest feature here. It uses the Facebook and Twitter integration of OS X to pull links posted by friends. This way you can open up the Sidebar in Safari and get easy access to all the links that have been posted without sifting through hundreds of tweets to find them. Annoyingly, there is no toolbar button to activate the Sidebar. The keyboard shortcut is an unintuitive CMD + Shift + L, or you can click on View -> Show Sidebar. A dedicated button, such as the buttons used for navigating back and forward between pages, or sharing links, would’ve thrust this feature into the limelight. As it sits now, it’s something most people will likely discover by accident, or not at all. Speaking of buttons, the + button makes a return after going missing in 10.8. In Safari 7 this can be clicked to immediately add the current tab to the Reading List, but holding it in shows more options for saving the current tab to a specific bookmark folder or adding it to the Top Sites view. Security also features, and in two ways. The first is with Safari 7’s deep integration with iCloud Keychain. Apple’s password manager is a bit haphazard when it comes to storing and filling out passwords, bit iCloud Keychain could solve that. In practice this has worked well. iCloud Keychain has reliably filled out passwords it’s asked to store. That’s useful for the other feature it has: random password suggestions. Whenever you sign up for a new account it’ll detect the password field and automatically suggest a complex password. Simply clicking on that box will enter the password (and confirmation password, if the site requests it), and then store the new password in iCloud Keychain. The same goes for credit cards. 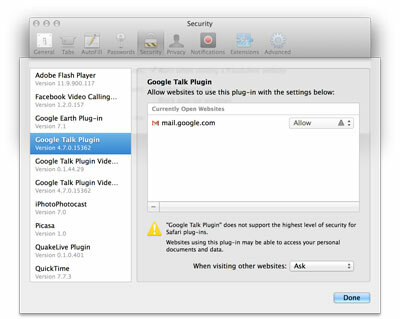 The second new security feature is through a new view to manage website plugins. This is not for extensions that add features to Safari, but rather plugins such as Adobe Flash Player, Google Earth Viewer, and 3D gaming plugins. It’s now possible to control these plugins per website, so you can have Adobe Flash Player enabled for every website, or limit it to just YouTube. This benefits two things: security and power consumption. The former through limiting the number of websites that can run exploits via plugins that may have security flaws. The latter by limiting how many sites can access plugins that drain power. 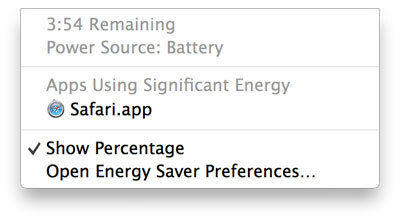 That brings us neatly to the last major feature in Safari for Mavericks: power management. Since we now live in our web browsers it makes sense that this was a focus area for Apple, and the biggest culprit, without a doubt, is Adobe Flash. It is notorious for ramping up processor usage (and thus impact power consumption), so Safari 7 will disable plugins that are in other tabs or simply using a lot of power. Returning to a page with a disabled plugin shows a small notification saying the plugin was disabled. Clicking on it will enable it. This goes for all plugins, though Flash was singled out simple because it’s the most common example. One of the two new-to-OS X apps, iBooks aims to bring a bit of iOS magic to the desktop. The application is fairly straightforward. 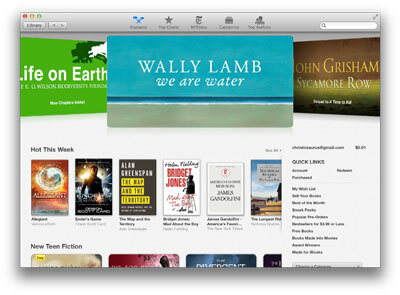 It grabs existing books in your iBooks library (courtesy of iTunes), and lets you log in with your account. Once that’s set up, you can purchase and download from the iBooks store, as well as view your library. Reading books on a desktop computer or laptop might not be something that everybody is interested in – especially those who have tablets – but it does come with the convenience of syncing bookmarks across devices, as well as notes. One great example would be a student who uses their laptop to create margin notes in a textbook, and those then sync to iBooks on a iPhone or iPad. As a book-reading app, iBooks has everything you need: font size adjustment, chapter navigation, interactive pages and links, bookmarks, and even the option to have the book read aloud, using built-in text-to-speech technology in OS X. All of this is moot, though, because the iBooks store is not available for South Africans, yet. Maps is another iOS port, but one that will quickly earn its place as a regular. Like Maps on iOS, it’s a standalone application that lets you search for addresses and points of interest, get driving directions, and even view live traffic. The interface works just as smoothly as it does on iOS, especially on Macs with multi-touch trackpads. It’s far handier having a standalone application to access maps than loading up a tab in Safari and navigating to Google Maps. While the quality of Apple’s maps isn’t quite as good, it’s getting there. Currently it lacks an extensive points-of-interest database, while Google’s Maps have the power of Google Search. But, right now, Apple Maps on Mavericks is good enough to get directions and look for places, if you can afford to spend a bit of time searching. One huge draw is the integration with Apple’s other apps and devices. 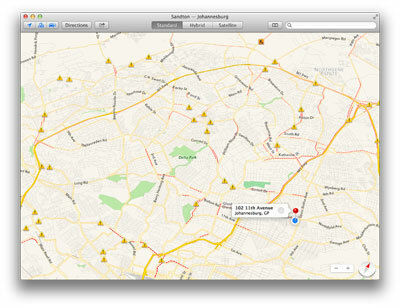 Maps on Mavericks pulls addresses from your contacts, chats. and from emails. Click on an address in one of those applications and you’re given the options to view the address in Maps, from where you can get driving directions. The share button lets the location or directions be shared via email, a chat, or even sent directly to an iOS device. The latter is one of those “Holy cow!” features when first seen in action. It shows what is capable with technology when everything just works. The magic of seeing map zooming off screen and appearing on your iPhone seconds later creates a smile every time. The fact that you can then swipe on the map notification on the iPhone, and it immediately opens up the map, just seals the deal. Maps is really great on Mavericks, and it’ll only get better as more people start using it. This could be the turning point for Apple in its war to win an audience for its mapping solution. With the big applications out of the way, here’s what’s new in the other applications on OS X Mavericks. 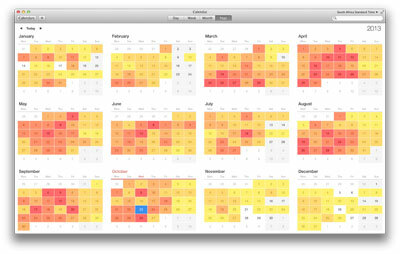 Calendar receives an entirely new interface, as mentioned in the section on Appearance and Design. The biggest new addition is integration with Maps, which now show up with location information for any appointment that has an address set. Apple’s also been kind enough to include weather data for the location of the appointment. Mail is nearly identical to previous versions, but there are a few small welcome touches in Mavericks. Unified mailbox views can now be viewed on a per-account mail basis; the search tool now lets you search for attachments; and integration with the Notification Center lets you reply from notifications. Contacts also loses its ugly graphics, but the new version – in plain white – looks a little uninspiring. Notes also gets a fresh coat of paint. Gone is the faux yellow notebook. In its stead is a beige paper texture – which doesn’t look attractive at all – and the handwritten felt tip font is now replaced by a regular system font. The notes app is functional – and that’s about as complimentary as it’ll get for what looks and feels like a design team’s afterthought. The Reminders application remains almost untouched – which means it looks like the skinned app from OS X 10.8, resembling – wait for it – a notepad on which you’d write down reminders. If we’re honest, a bit more engineering and design could have seen Notes and Reminders as a single app with killer functionality for to-do lists. Photo Booth is not mentioned anywhere on Apple’s list for new things in Mavericks, but it has a few new filters – cool ones, actually. But the legacy of skeuomorphism still haunts this fun application: run it in full screen mode and it has gaudy graphics depicting red curtains and wood textures. Photo Booth will also let you set your profile photo for Facebook and LinkedIn, directly from the app. Activity Monitor has been mentioned a few times in the other sections, but in Mavericks this revamped system tool is – in a word – awesome. It looks better and presents far more useful information about everything you’d realistically need to know. Aside from the overhauled applications and underlying tech, Mavericks has a few new features in the OS itself. These are little settings or baked-in functions that enhance the way the OS works, and are now even better than before. 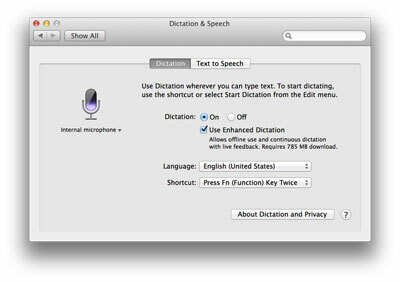 Voice Dictation now doesn’t require online access – but to enable this option you need to download a 795MB file. This download also enables Live Typing, where words appear as you speak them. The voice dictation feature works incredibly well, and can be hugely useful for those who need to capture large texts or compose lengthy emails. Multiple displays are now supported for apps in full screen mode. Previously the second display would show the infamous linen texture when an app ran full screen on a primary display. Notification Center: It’s now possible to interact with notifications. Receive a chat, and you can quickly reply from a notification rather than opening up Messages. The same goes for emails. Websites can also push notifications to your desktop (think news headlines), and all notifications pile up to let you know what you missed while you were away from your computer. Online accounts: LinkedIn can now be added as a social account, which integrates with sharing features in OS X. Any app can now export a document as a PDF – from emails to text files, PDF away, to your heart’s content. Believe it or not, this comprehensive look at Apple’s latest OS has missed some – but only a few, and very small – features. What is about is everything you’ll need to know as a regular consumer, and perhaps even power users could discover something new. It’s not as tremendous an overhaul as, say, the move from Tiger to Leopard, or Snow Leopard. There are more hidden changes here – engineering that will be appreciated by those who know about it, but regular users won’t be any the wiser. That said, the biggest benefit from all that engineering is a huge, usable increase in battery life. Anybody who uses an Apple laptop should upgrade to Mavericks as a matter of urgency, just to gain that free battery life upgrade. The fact that it’s free can also not be discounted. This is clearly Apple’s move to get its latest technology on as many computers as possible. It’s not a grab for the desktop marketshare – Microsoft clearly leads, there – but rather a way to present the Apple experience in the best way possible. Buy your iPhone and a Macbook, and you’ll have the best integrated computing and smartphone experience in the world. No other platform can offer what the combination of Mavericks and iOS delivers when working together. That said, it’s a very advanced piece of software and without the iOS integration it still stands alone as worthy upgrade that we’d be happy to pay for. Where Mavericks and its big features work, they work extremely well. However, the half-baked features and some of the older apps and graphics, are a bit distracting. At least those can be excused because it’s clear that a lot of work went into the underlying technology that keeps things purring along. Our number one wish list item, now, is for the next version of OS X to strip out and reimagine the forgotten apps, and fine-tune some of those integration features for an even better experience.